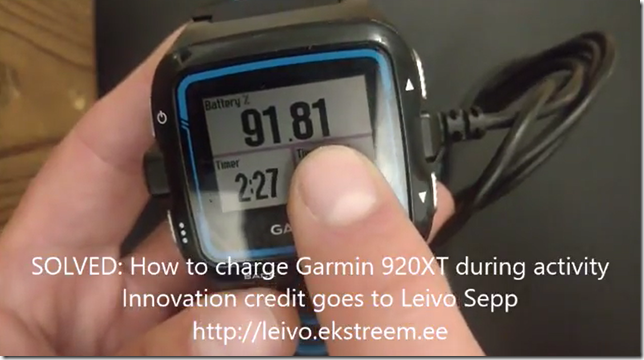 One of the most asked features from ultrarunners: How to charge Garmin 920XT during activity. SOLVED! Press the power button - clip the watch into the charger and at the same time keep pressing the power button until you see the screen to turn your watch on/off. Don’t turn it off. And that’s the trick. It works like a charm. In ultramarathons you have to run for far longer than 10 hours. 24h, 48h etc, you name it. There are no watches in the market which can last for the whole competition. The new 935XT can be charged during an activity, but that is awful, because you cannot put it in your hand during charging. But 920XT has a really convinient plate, so you can easily wear your watch on your hand when it is in charging mode during activities. I started to prepare for my 100 miles ultramarathon where my goal is to finish in 30 hours. This means that I have to charge my Garmin 920XT during an activity. First, I was thinking of doing some physical trick with the charging cable, as there are just two wires needed for charging and maybe I can charge it if I disconnect the other two. That was just a crazy idea.